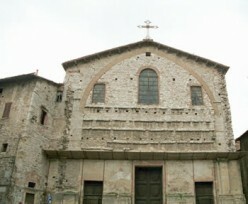 The first origins of St. Domenico church, entitled originally to S.Martino, date back to XI century. The Dominican widened it in the XIV century and recent restorations have brought back to light some frescoes of the '300s and of the Nelli school. A beautiful mercy in earthenware of the 1400 and a finely inlaid desk are conserved at the inside of the church.